HORACE AND WIMZIE FROM WIMZIES HOUSE EDEN CINAR VERY NICE CONDITION. EDEN Peter Rabbit Pastel Velvety Plush Bunny Embroidered Eyes. Condition is Used. Shipped with USPS First Class Package. USED CONDITION, THE TERRY OUTFIT SHOWS PILLING BALLS FROM WASH AND THE VINYL SOLES OF THE FEET HAVE DISCOLORED. YOU WILL RECEIVE EXACTLY WHAT IS PICTURED/PHOTOGRAPHED. TIP: MOUSE OVER THE PHOTO TO VIEW A POP-UP OF AN ENLARGED VERSION OF THE PHOTO TO SEE ALL THE DETAILS! Eden Large Plush Old Man Mr. McGregor Beatrix Potter Tale of Peter Rabbit. Condition is Used. Shipped with USPS Priority Mail. No holes or stains and comes from a smoke free home. Made of velour type fabric. Very Clean. Both have been professionally cleaned with hypoallergenic products. Mrs. Rabbit has a hole in her dress and a hole in her scarf. Peter Rabbit Plush. Mrs. Rabbit Plush. The MONKEY Plush is in Good. 15" Kohl's Plush MONKEY. They are original to the manufacturer. HAND, HAND, FINGERS, THUMB Board Book by Al Perkins. Lot of 2 15" Plush MONKEY and Board Book ~ Al Perkins. These are 5” tall. They are fully jointed. Very soft fur with a hard body. It feels like the body is made of wood. There is no “give” when you squeeze any part of the body. I did not find any other bunnies like this so I do not know what the bodies are made of. Great little plush crib toy by Eden in original box and wrapping. Eden Baby Bunny Plush Soft Toy Tale of PETER RABBIT 8" Stuffed Little Book 30320. Condition: The plush is a beautiful color, Clean and Nice Condition, Book has shelf wear and corner back cover is clipped. Stitched nose, satin bow. The item pictured will be the actual one you will receive. Approx 9" around tummy. EASTER BUNNY RABBIT. approx 6" Mini Lying Down Plush Stuffed Soft Toy. Features: Gray and White plush, soft stuffed, plastic eyes, nose. Material: Stuffed plush, polyester fiber. Vintage Frederick Warne Eden Toys Plush Mrs Peter Rabbit Cottontail. Condition is Used. This is a Beatrix Potter PETER RABBIT Plush Stuffed Animal. Made by Kids Preferred. It is in Great Condition. No tears or defects. Eden Petter Rabbit Talking Plush Read with me Holding Book Easter Beatrix Potter. Condition is Used. Shipped with USPS Priority Mail. Eden Talking Peter Rabbit Plush “ Read With Me” •Press his ear and he reads a story “ Peter Rabbit Tales “... Every time you press his ear he reads a page to you •Requires 3 AA Batteries ( included) Measures Approx. 12” **No books included. Only Plush . Plush works without paper book . Very Good Condition Thanks! Condition is Used. Wearing Green Corduroy Overalls, With Yellow Buttons, Blue, and White Striped Lining; CORDUROY Embroidered in Yellow on Front. This pre owned Mr Jeremy Fisher frog plush from Eden Toys is in very good used condition. 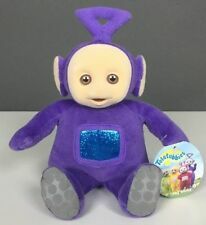 The bigger plush is battery operated from Eden, about 11" tall and plays Rock A Bye Baby when his hand is squeezed, tested but batteries are not included (2AA). Plus a set of 14 miniature books in a little drawer and a new set with a mini plush and book. Vintage Brown Andre The Seal Plush Hand Puppet Toy 1994 Stuffed Animal DAKIN 18"
10" Eden Baby Tunes MUSICAL Wind Up Plush Mary Had A Little Lamb Head Moves. THIS IS A LOT OF BEATRIX POTTER PETER RABBIT PLUSH. AND MY FAVORITE IS THE 2 SCENT HANGER ONES OF TOM KITTEN AND PETER RABBIT. MADE WELL SEAMSTRESS IF NOT MANUFACTURED. This is a teddy bear by Eden. It is a tan/beige color. It is wearing a non removable outfit that is primary colors and denim. The plush is soft and clean. Vintage Eden Toys Musical Wind-Up 10" Bear (PA#4) Still Works! Eden Toy Stuffed Musical Bear. Still Works! Sounds Great! 13” The Snowman. Pre owned with expected wear from use and washing. A Kids Preferred plush. A few red (threads) on his lower bottom. Barely visible.See last photo. HUGE 44” Vintage 80s OBO BLUE & WHITE EDEN Plush Clown SOFT & BRIGHT Very Clean! In beautiful condition. Looks almost new! Soft & clean! Bright with rich colors! Has wear and marks. Has writing and tearing on bottom of shoes. Shoelace is coming untied. Best musical lion ever! This bright fella plays the tune "You are my sunshine" when his internal music box is wound. and his cloth label too. There is a red heart box that when squeezed you can feel like a pulsating heartbeat. 12" plush Lamb holding a blue blanket. Eden Learning Curve. Good Used Condition. Color: Brown fur, Beige sweater with red "CURIOUS GEORGE", Red hat. Type: Curious George Monkey. Fur type: Thick Brown fur. Beatrix Potter Collectibles an Eden gift. 7" plush Benjamin Bunny. The World Of Peter Rabbit. Eden 11" Plush Peter Rabbit Beatrix Potter Stuffed Animal. This bear has a red coat with a decorative button to close. 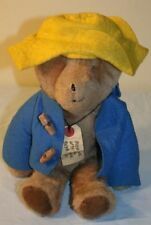 The jacket and hat are made of felt and this bear is in good condition with a few very small minor tears in the hat. This bear has a blue coat with a decorative button to close. Vintage Eden Terry Cloth Turtle Stuffed Plush Toy Rattle Gingham Check 6"
Vintage Eden Terrycloth Turtle Stuffed Plush Rattle Toy Gingham Check Blue Pink Yellow 6" Little turtle plush has little nylon bow at his neck, ruffles, colorful shell, terry cloth body, and rattles when shaken. He is used and has some flaws - ruffles yellowing, white needs washed, and one eye needs to be fixed or tightened with stitching. I steamed cleaned the plush to sanitize. Please see all pictures of item and condition. Item will be sent USPS First Class Mail. Thank you. Clown does have a couple of very faint spots. One on foot and one on back. See last 2 pictures. Might launder out if treated. I would like a chance to make it right. I provide multiple photographs of each item for that purpose. Has embroidered eyes, nose, & mouth, and a tuft of yellow yarn hair. Paddington Bear Cowboy Eden Red Plaid Shirt Plush Stuffed Sherpa Soft Toy 11"
Western cowboy clothing is actually part of his body and is not removable. Softly stuffed - no beans or pellets inside. Selling a Rare Vintage 1979 Eden Toys Arnold Lobel Frog Toad Stuffed Doll w/ all Pieces (Hat, Pants, and Jacket) in Pre-Owned condition. He measures 21 inches in lenght and does not have any foul smells. 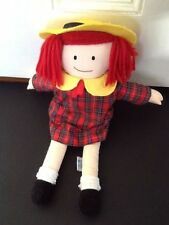 He comes with a felt hat which is sewn in, felt jacket which is removable, and removable plaid pants with a matching felt trim on pants. Due to its age, the elastic on the back of the pants has lost elasticity. He has a tag (covered by the pants) which states the doll was sewn in Haiti. This cutie is a great addition to anyone's collection or nursery decor. Sold "AS IS", Please ask any further questions before purchasing. Shipped Free with UPS Ground.